B cells have been implicated in the pathogenesis of rheumatoid arthritis (RA) since the discovery of RA as an autoimmune disease. There is renewed interest in B cells in RA based on the clinical efficacy of B cell depletion therapy in RA patients. Although, reduced titers of rheumatoid factor and anti-cyclic citrullinated peptide Abs are recorded, the mechanisms that convey clinical improvement are incompletely understood. In the proteoglycan-induced arthritis (PGIA) mouse model of RA, we reported that Ag-specific B cells have two important functions in the development of arthritis. PG-specific B cells are required as autoantibody-producing cells as well as Ag-specific APCs. Herein we report on the effects of anti-CD20 mAb B cell depletion therapy in PGIA. Mice were sensitized to PG and treated with anti-CD20 Ab at a time when PG-specific autoantibodies and T cell activation were evident but before acute arthritis. In mice treated with anti-CD20 mAb, development of arthritis was significantly reduced in comparison to control mAb-treated mice. B cell depletion reduced the PG-specific autoantibody response. Furthermore, there was a significant reduction in the PG-specific CD4+ T cell recall response as well as significantly fewer PG-specific CD4+ T cells producing IFN-γ and IL-17, but not IL-4. The reduction in PG-specific T cells was confirmed by the inability of CD4+ T cells from B cell-depleted mice to adoptively transfer disease into SCID mice. Overall, B cell depletion during PGIA significantly reduced disease and inhibited both autoreactive B cell and T cell function. Rheumatoid arthritis (RA)3 is a chronic and degenerative autoimmune disease that affects the synovial joints (1). Inflammation leads to cartilage degradation and bone erosion, resulting in debilitating pain, joint deformity, and immobility (2, 3). Although the precise factors that initiate disease have not been identified, several cell types have been implicated as mediators of disease, including neutrophils, macrophages, B cells, and T cells (4). The identification of rheumatoid factor (RF) in RA as an autoantibody provided the first key indicator that RA is an autoimmune disease (5). However, because RF is not always associated with RA and because RF could be produced in diseases other than RA, interest in B cells waned (6). Recently, the importance of B cells in RA has been resurrected based on the clinical efficacy of B cell depletion therapy (rituximab) in RA patients (7, 8). Rituximab is a chimeric anti-human CD20 mAb that selectively depletes immature and mature B cells, as CD20 is only expressed after the pro-B cell stage and is not expressed on plasma cells (9). Although autoantibodies are reduced in most RA patients treated with anti-CD20, autoantibody reduction does not always correlate with efficacy, suggesting that loss of other B cell functions may contribute to suppression of RA (8, 10, 11, 12). Several autoimmune diseases, including systemic lupus erythematosus (SLE) and RA, are characterized by the presence of autoantibodies (13). In RA, the presence of RF and anti-cyclic citrullinated peptide autoantibodies in the serum are an early predictor of disease in 50% of RA patients by an average of 7.5 years (14). Autoantibodies bind to target epitopes, forming immune complexes that activate complement components and Fc receptor-bearing cells that contribute to RA pathogenesis (15, 16). In several murine models of RA, autoantibodies are pathogenic, particularly the K/BxN and collagen-induced arthritis (CIA) models where disease is initiated by transfer of autoantibodies to GPI and collagen respectively (17, 18, 19, 20). Unlike these models, in proteoglycan (PG)-induced arthritis (PGIA), autoantibodies are required for initiation of disease but are insufficient to transfer arthritis (19, 21, 22). In addition to producing Abs, there are several functions of B cells that could contribute to autoimmunity (11). B cells are highly competent APCs and present Ag 103-104-fold more efficiently than do macrophages or dendritic cells (23). Costimulatory molecules CD80 and CD86 are up-regulated on activated B cells, permitting T–B cell interaction. B cells also express proinflammatory cytokines that may contribute to inflammation (24, 25, 26). PGIA is dependent on Ag-specific B cells, and autoreactive T cells are not sufficiently activated to induce arthritis unless PG is presented by B cells (19). Selective deletion of costimulatory molecules CD80 and CD86 on PG-specific B cells is essential for autoreactive T cell activation and the development of arthritis (27). The requirement for primed autoreactive B and T cells to sustain PGIA suggests a need for reciprocal interactions that maintain chronic autoreactivity (28). Several studies in animal models of autoimmune disease have shed some light on the role of B cell depletion in autoimmunity (29). In CIA, depletion of B cells with an Ab specific for mouse CD20 administered before initiation of CIA delays the onset of disease; however, B cell depletion was not therapeutic after collagen immunization (30). Recently, anti-CD20 mAb conferred resistance in a murine model of lupus when treatment began at an early age and was continued for several weeks (31). The ability of anti-CD20 therapy to ameliorate or delay disease in these models may be due to the timing of treatment. Depletion of B cells in both models was before any clinical signs of disease and may mimic the disease course of B cell−/− mice, thus suggesting that B cells are important in initiation of autoimmunity (32, 33). We were therefore interested in determining whether B cells are important in maintaining chronic autoimmune disease. PGIA develops in BALB/c mice after two to three injections of PG in adjuvant, and systemic autoantibody and autoreactive T cells are activated before any signs of arthritis. In the present study, we depleted B cells with an Ab to CD20 at a time point after PG-specific Ab and T cell reactivity were present but before any clinical evidence of arthritis. In mice administered anti-mCD20, joint inflammation stabilized and subsequently waned along with autoantibody titers. CD4+ T cells from B cell-depleted mice were significantly suppressed in their ability to respond to PG and were not efficient in inducing arthritis when adoptively transferred. Cytokine production by CD4+ T cells indicated that although the Th2 cells were not affected, Th1 and Th17 cytokine production was significantly inhibited. This study demonstrates that B cells are important as autoantibody-secreting cells and as activators of autoreactive T cells. Importantly, these experiments indicate that B cells are essential after initial sensitization for maintaining T cell reactivity and suggest that B cells are critical APCc for chronic maintenance of autoimmunity. Female BALB/c and SCID mice were purchased from the National Cancer Institute and maintained under germ-free conditions in our animal care facility (Rush University Medical Center, Chicago, IL). Mice >3 mo of age were immunized i.p. with 150 μg of human PG (aggrecan) measured as protein emulsified in 2 mg of the synthetic adjuvant dimethyldioctadecylammonium bromide (DDA) (Sigma-Aldrich) and boosted with 100 μg PG/DDA on day 21 as described previously (34). PG was obtained from human cartilage of joint replacement surgeries, as approved by the Institutional Review Board of Rush University Medical Center, and purified as previously described by extraction with 4 M guanidinium chloride followed by cesium chloride gradient centrifugation and treatment with chondroitinase ABC and endo-β-galactosidase (35). Native mouse PG was from epiphyseal cartilage from skeletal tissues of 4–7-day-old mice and prepared as described for human PG but not deglycosylated. All animal experiments were approved by the Animal Care and Use Committee at Rush University Medical Center. Mice were scored for arthritis development by a blinded observer. The scoring of PGIA was on a scale from 0 to 4 for each paw, with a possible total score of 0–16. Scoring of each paw was as follows: 0, normal; 1, mild erythema and swelling of several digits; 2, moderate erythema and swelling; 3, more diffuse erythema and swelling; and 4, severe erythema and swelling of complete paw with ankylosis. Scoring of joints was conducted three times a week. The hindlimbs of mice treated with control mAb or anti-CD20 mAb were dissected, fixed in formalin, decalcified, and embedded in paraffin. The tissue sections were stained with H&E. In experiments to assess the kinetics of B cell depletion, naive cells from spleen, popliteal lymph nodes, bone marrow, and peritoneal cavity (PE) lavages were collected at days 1, 3, 7, 14, and 21 following i.v. injection of 250 μg of anti-mouse CD20 mAb (18B12, IgG2a) (31) or control Ab anti-human CD20 mAb (2B8), an engineered IgG2a derivative of the 2B8 IgG1 mouse parent of rituximab that has no cross-reactivity with mouse CD20. 18B12 anti-mouse CD20 was generated by immunization of CD20−/− mice with CD20-transfected cell lines and CD20-peptide-keyhole limpet hemocyanin conjugate (36). The 18B12 IgG2a variant was generated by cloning and expression of 18B12 variable domain with the IgG2a constant region in CHO cells. Mouse B cell subsets were characterized by flow cytometry after staining with Abs: anti-IgD FITC, anti-CD21 PE, anti-B220 PerCp, anti-IgM APC, anti-IgM PerCp-Cy5.5, anti-CD5 PE, anti-CD38 FITC, anti-B220 PE, anti-B220 FITC, anti-CD43 PE, (BD Biosciences), and anti-CD23 APC (Abcam). Profiling of B cell depletion in PG-immunized mice was performed at days 7 and 21 after anti-CD20 mAb treatment, and cells were isolated from spleen, popliteal lymph nodes, bone marrow, and PE lavages. Mice were administered anti-CD20 mAb and control mAb 4 days following the second PG-DDA immunization. B cell depletion was monitored weekly by bleeding mice from the orbital plexus and staining cells with anti-CD19 PE, anti-CD3 APC, and anti-CD11b FITC (BD Biosciences). Percentage of B cell depletion was calculated as (average of specific subset in anti-CD20 treated mice (n = 3)/average of control Ab-treated mice (n = 3)) × 100. The PBMC B cell percentage was determined after gating out CD11b+ from total viable cells. B cell subsets were determined by flow cytometry using a FACSCalibur II and FACSDiva software (BD Biosciences). Data represent the means ± SEM. Immunized mice were bled from the orbital plexus before anti-CD20 or control Ab treatment and every week following Ab injection. Serum was obtained and examined for Abs against mouse and human PG by ELISA. EIA tissue culture 96 “half-area” plates (Costar, Corning) were coated overnight with 0.5 μg human PG, or 0.75 μg native mouse PG in carbonate buffer. Serially diluted (PBS/0.5% Tween 20) serum samples and internal standards (pooled sera from arthritic mice) were incubated with immobilized PGs. Abs were detected colorimetrically with HRP-labeled anti-mouse IgG1 or IgG2a (Invitrogen Life Technologies) and the substrate o-phenylenediamine. The relative concentrations of human and mouse PG were calculated based on titration of known concentration of unlabeled murine IgG1 and IgG2a bound to the ELISA plate (SouthernBiotech). Murine Abs were detected with HRP-labeled anti-IgG1 or anti-IgG2a to establish a standard curve. Based on the standard curve, the relative concentration of anti-human and anti-mouse PG was determined. Data represent the means ± SEM. Spleens were isolated from PG-immunized mice treated with either anti-CD20 mAb or control mAb 21 days after treatment. CD4+ T cells were purified by negative selection using microbeads (Miltenyi Biotec). Alternatively, as indicated in the figure legends, T cells obtained from the PE exudates of PG-immunized mice were purified by nylon wool purification (pooled from 4–6 mice). CD4+ T cells (2.5 × 105 cells/well) were stimulated with PG (10 μg/ml) and an equal number of irradiated spleen cells (2500 rad) from naive wild-type BALB/c mice. Cells were cultured in quadruplicate in 96-well falcon plates (Fisher Scientific) in RPMI 1640 media containing 10% FCS, 100 μg/ml penicillin, 100 μg/ml streptomycin, 50 μM 2-ME, and 2 mM l-glutamine (complete media). Cultures were pulsed overnight on day 4 with [3H]thymidine and examined for proliferation. Data represent the means ± SEM. Spleens from PG-immunized mice were harvested 21 days after treatment with anti-CD20 mAb or control mAb. CD4+ T cells were purified by negative selection. CD4+ T cells from each group were subsequently assessed for the number of IL-4, IL-17, and IFN-γ producers in response to PG restimulation in culture by ELISPOT. Sterile multiscreen plates (Millipore) were coated with capture Ab overnight at 4°C, and blocked for 1 h before addition of CD4+ T cells (3 × 105 cells/well) and irradiated naive spleen cells (2500 rad) (2 × 105 cells/well) and PG (10 μg/ml). Cells were incubated for 48 h to screen for IFN-γ, and 72 h to screen for IL-17 and IL-4. Cytokines were detected using HRP-labeled Abs specific for IFN-γ, IL-4, or IL-17, and read using ELISPOT reader and software (ImmunoSpot Analyzer and ImmunoSpot software, CTL Analyzers). Data represent the means ± SEM. For adoptive transfer experiments, spleens from naive mice and PGIA-immunized mice treated with anti-mCD20 mAb or control mAb mice were harvested, and CD4+ T cells were purified by negative selection. Simultaneously, spleens from another set of arthritic, PG-immunized mice were depleted of T cells using Thy1.2 (CD90) microbeads and used as a source of B cells and APCs. CD4+-purified T cells (1 × 107) from either anti-mCD20 mAb, control Ab-treated PGIA mice, or naive mice were mixed with T-depleted spleen cells of PGIA mice (1.5 × 107) and 100 μg of PG in saline, and then injected i.p. into female SCID mice. Development of arthritis was monitored in SCID mice every 3 days after cell transfer. Data represent the means ± SEM. The Mann-Whitney U test was used to compare nonparametric data for statistical significance. Pearson’s correlation coefficient was used to calculate the correlation between reduction in arthritis and PG-specific Ab titers. Significance is based on a value of p < 0.05. We have previously shown that PG-specific B cells are required for the development of autoreactive T cells in the absence of circulating Ab (22). These results indicate that B cells directly function as APCs for T cell activation. What is not clear from these studies is whether B cells are essential for maintaining T cell activation after initiation of disease (22). To address this question we assessed the requirement for B cells after an immune response to PG was initiated by depleting B cells. We initially examined B cell subset depletion in naive BALB/c mice using an IgG2a anti-mouse CD20 mAb (anti-mCD20). Mice were treated with a single i.v. injection of 250 μg/mouse of either anti-mCD20 mAb or control mAb. This dose was based on preliminary experiments in other strains of mice (data not shown). Blood, spleen, popliteal lymph nodes, bone marrow, and PE cells were harvested from mice 1, 3, 7, 14, and 21 days after mAb treatment. In the blood, mature B cell (CD19+) numbers were considerably reduced (90.7%) after 1 day, and by day 3 the cells were entirely depleted (99.5%) (Fig. 1⇓A). Pro-B cells (B220lowIgM−CD43+) of the bone marrow were the only subset not depleted due to their lack of CD20 expression (Fig. 1⇓A). The increase in pro-B cell numbers during depletion may be due to an attempt to repopulate B cell compartments to homeostatic levels. Pre-B cells (B220lowIgM−CD43−) in the bone marrow were maximally depleted (31.7%) on day 7, followed by a recovery of this subset (Fig. 1⇓A). Immature B cells (B220lowIgM+CD43−) in the bone marrow reached a maximum depletion of 85.8% on day 7, followed by a recovery to 19.0% on day 21 (Fig. 1⇓A). Mature B cells (B220highIgM+) demonstrated a similar pattern of depletion and were rapidly depleted in the bone marrow at day 1 and reached a maximum depletion of 87.0% on day 3 (Fig. 1⇓A). Anti-mCD20 mAb B cell depletion in naive BALB/c mice. Aged-matched BALB/c mice received 250 μg of either anti-mCD20 or control mAb i.v. Presence of B cell subsets were assessed on 1, 3, 7, 14, and 21 days after mAb injection. Subsets assessed included: (A) CD19+ mature B cells of the blood and the mature B cells (B220highIgM+), immature B cells (B220lowIgM+CD43−), pre-B cells (B220lowIgM−CD43−), and pro-B cells (B220lowIgM−CD43+) of the bone marrow; (B) germinal center (CD38+B220+) and follicular (CD21+CD23+) B cells of the lymph nodes; (C) B1a (CD11blowCD5+IgMhighB220+/−), B1b (CD11blowCD5−IgMhigh B220+/−), and B2 (CD11b−CD5−IgM+/−B220high) B cells of the peritoneal cavity; (D) T1 (B220+CD21−IgMhigh), T2 (B220+CD21highIgMhighIgDhigh), mature (B220+CD21+IgM+IgDhigh), and marginal zone (B220+CD21+IgMhighIgDlow) B cells of the spleen. Histograms indicate the percentage of B cells from anti-mCD20 mAb compared with anti-hCD20 mAb-treated mice and represent the average of three independent experiments ± SEM. Possibly the most important sites of depletion are the two main sites of B cell activation and expansion, the spleen and lymph nodes. In the spleen, T1 (B220+CD21−IgM+) cells were the most difficult to deplete, having only reached 76.3% depletion on day 14, which may be due to the time needed to fully deplete existing T1 cells and the influx of newly created B cells from the bone marrow (Fig. 1⇑D). The T2 (B220+CD21+IgMhighIgDhigh) B cells in the spleen were depleted by day 7 (Fig. 1⇑D). Total mature (B220+CD21+IgM+IgD+) and marginal zone (B220+CD21+IgMhighIgDlow) B cells of the spleen were depleted 98.7 and 99.0%, respectively, on day 14 (Fig. 1⇑D). The lymph nodes were the most susceptible to anti-CD20 treatment, with the germinal center (CD38+B220+) and follicular (CD21+CD23+) B cells being depleted by 93.5 and 92.6%, respectively, on day 7 (Fig. 1⇑B). The most resistant B cell subsets to depletion were of the peritoneal cavity with B1a (CD11blowCD5+IgMhighB220+/−), B1b (CD11blowCD5−IgMhighB220+/−), and B2 (CD11b−CD5−IgMhighB220+/−) B cells being only 25.4, 28.7, and 67.1% depleted, respectively (Fig. 1⇑C). Similar results have been seen by others and were due to inaccessibility of Fc receptor-bearing cells to the peritoneal cavity (37) and not due to insufficient coating of cells with anti-CD20 mAb (38). Based on the B cell-depletion profile in nonimmune mice, we assessed the profile of B cell depletion in BALB/c mice immunized with PG. Naive mice or mice immunized twice with PG in adjuvant were treated with either anti-mCD20 mAb or control mAb 4 days after the second immunization. Tissues and cells were harvested on days 7 and 21 after mAb treatment and stained to assess depletion of the different B cell populations. Mature B cells of the bone marrow were similarly depleted on day 7 in both naive and immunized mice, but by day 21 mature B cells of immunized mice recovered significantly faster (p = 0.046) than did those of naive mice (Fig. 2⇓A). Similarly, the levels of CD19+ B cells in the blood of immune mice also reflected an accelerated repopulation in comparison to naive mice (p = 0.037), although both were still almost completely depleted at day 21 (Fig. 2⇓A). Anti-mCD20 mAb depletion in PG-immunized BALB/c mice. Aged-matched BALB/c mice were boosted with PG in adjuvant at 3 wk and 4 days after they were injected i.v. with 250 μg of either anti-mCD20 mAb or control mAb. Blood and bone marrow (A), lymph nodes (B), peritoneal lavages (C), and spleens (D) were harvested at days 7 and 21 after Ab injection and were assessed for depletion of B cell subsets. Histograms indicate the percentage of B cells of anti-mCD20 mAb compared with control mAb treated mice and represent the average of three independent experiments ± SEM. Interestingly, B cell subsets at sites of activation in secondary lymphoid tissues were more resistant to anti-mCD20 depletion in immune mice than in naive mice. The splenic subsets including follicular, total mature, and particularly marginal zone B cells proved the most resistant to depletion in immunized mice at both 7 and 21 days (p = 0.05) (Fig. 2⇑D). Follicular B cells of popliteal lymph nodes in immunized mice were also more challenging to deplete than in naive mice on day 7 (p = 0.046), and on day 21 they were also less depleted than in naive mice (Fig. 2⇑B). The remaining splenic and lymph node B cell subsets on 7 and 21 days, although not significant, did show more resistance to depletion than did those of naive mice (Fig. 2⇑, B and D). The amount of depletion of all subsets continued to increase from 7 to 21 days in both naive and immunized mice. The resistance observed of immunized mouse B cells to depletion by anti-mCD20 mAb treatment may be due to a higher rate of B cell output from the bone marrow, which accounted for a faster repopulation of these B cell compartments. Also, an inherent property of activated B cells may confer a higher resistance to depletion, as described in a spontaneous model of SLE (31). In a surprise reaffirmation of the mechanism of resistance by peritoneal cavity B cells to anti-CD20 mAb depletion in naive mice, immunized mice were completely depleted for all peritoneal cavity B cell subsets by day 7. PG-DDA i.p. immunized mice showed a 99.5, 99.0, and 98.7% depletion of B1a, B1b, and B2 subsets, respectively (Fig. 2⇑C). The increased susceptibility of immunized mouse peritoneal cavity B cell subsets to depletion may be due to an influx of Fc receptor-bearing cells such as macrophages in response to immunization. DDA has been shown to increase the attraction of macrophages to sites of injection, which may increase Fc receptor-mediated depletion (39). To study the mechanism by which B cell depletion affects an ongoing autoimmune response, a treatment period was chosen based on priming B and T cell responses to PG, but before development of maximum arthritis. Preliminary experiments showed that 4 days following the second immunization of PG-DDA, mice developed significantly higher levels of anti-mouse PG IgG1 (p = 0.023) and IgG2a (p = 0.023), as well as anti-human PG IgG1 (p = 0.025) and IgG2a (p = 0.023) Ab titers than did naive BALB/c mice (Fig. 3⇓, B and C). The presence of anti-mouse and anti-human PG Abs indicated that autoreactive B cells had been activated. Similarly, T cells obtained at the same time from the peritoneal cavity demonstrated a significant PG-specific recall response (p = 0.021) when compared with naive mice (Fig. 3⇓A). Although both autoreactive B and T cells were activated at this point, severe inflammation of the peripheral joints had not been initiated (data not shown). Presence of PG-specific T and B cell reactivity at the time of B cell depletion. PE cells and serum were collected from BALB/c mice 1 wk following the second PG-DDA immunization. A, T cells from peritoneal lavages of PG-immunized mice (n = 3) were purified with nylon wool separation and subsequently restimulated with or without 10 μg/ml PG in vitro culture for 5 days. Proliferation was determined by 24 h [3H]thymidine incorporation. B, Serum PG-specific mouse IgG1 (mPG IgG1) and IgG2a (mPG IgG2a) and (C) human PG-specific IgG1 (hPG IgG1) and IgG2a (hPG IgG2a) titers of naive (n = 3) and immunized (n = 7–10) mice were measured by ELISA. Values are means ± SEM and are representative of three independent experiments. ∗, p < 0.05. The ability of PGIA to develop in mice treated with anti-mCD20 mAb was assessed by following the procedures outlined above. Four days following the second PG immunization, female BALB/c mice were injected i.v. with either 250 μg/mouse anti-mCD20 mAb or control mAb and observed for progression of PGIA by scoring fore- and hindlimbs for inflammation. The development of PGIA in mice depleted of B cells or treated with control Ab was indistinguishable until day 19 after mAb treatment, when both groups had developed an average PGIA score of ∼2.5 (Fig. 4⇓A). Subsequently, after day 19, mice treated with control mAb experienced a progressive increase in PGIA and more aggressive disease, whereas in mice treated with anti-mCD20 mAb arthritis did not progress or waned in severity (Fig. 4⇓A). The incidence of disease was 100% in both B cell-depleted and control mAb-treated groups by day 19 after mAb treatment (Fig. 4⇓B). The ability of B cell depletion to suppress inflammation remained relatively constant, even as circulating B cells (CD19+) recovered in the blood. Nearly complete depletion was maintained until week 4 after mAb treatment, when B cells steadily increased in the circulation, ultimately achieving a level of 73.8% of control mAb-treated mice by 11 wk, when the mice were sacrificed (Fig. 4⇓C). Suppression of PGIA by anti-mCD20 treatment. BALB/c mice were immunized i.p. with human PG in DDA twice at 3-wk intervals. Four days following the second PG-DDA immunization mice were either injected i.v. with anti-mCD20 mAb (n = 7–10) or control mAb (n = 7–10) and were monitored for arthritis. Arthritis severity (A) is the sum of the inflamed paws in individual mice divided by the number of mice with inflamed paws. Incidence (B) denotes the percentage of mice that develop PGIA. B cell recovery (C) was assessed weekly after Ab injection by examining the percentage of CD19+ B cells in the blood in anti-mCD20 mAb (n = 5–10) and control mAb (n = 5–10) mice by flow cytometry. Histograms indicate the percentage of B cells in anti-mCD20 mAb-treated mice compared with control mAb-treated mice. Values are means ± SEM and are representative of three independent experiments. ∗, p < 0.05. To determine the extent of inflammation, we assessed ankle joint histology in mAb-treated mice (Fig. 5⇓). In control mAb-treated mice, mononuclear and polymorphonuclear infiltration were profuse in tissues and joint spaces. Edema in the synovial and periarticular tissues was accompanied by synovial hyperplasia. Cartilage damage and bone erosion were also evident (Fig. 5⇓, B and D). In contrast, cellar infiltration and histopathological signs of arthritis were decreased in B cell depleted mice (Fig. 5⇓, A, C, and E). These data demonstrate that B cell depletion after the development of a PG-specific immune response suppresses arthritis, indicating that B cells are necessary to maintain the development of arthritis. Suppression of histopathology in the joints of anti-mCD20 mAb-treated mice. Hindlimbs of mice were dissected, fixed in formalin, decalcified, and embedded in paraffin. Tissue sections were stained with H&E. Sections are from representative ankle joints from control mAb-treated (B and D) and anti-mCD20 mAb-treated mice (A and C). Magnifications are ×4 objective (A and B) and ×10 objective (C and D). Cellular infiltration (E) was measured on a scale of 0–4 by a blinded observer, and values represent means ± SEM of 10–15 sections from three independent experiments. ∗, p < 0.05. In PGIA, autoantibodies are critical for the initiation of disease, solidifying their involvement in PGIA pathogenesis (22). To determine whether B cell depletion therapy reduced autoantibody titers, mice were bled 1 day before mAb treatment and every week thereafter for 7 wk. Serum samples were assayed for IgG1 and IgG2a anti-mouse and anti-human PG titers. Before B cell depletion, mice developed similar levels of IgG1 and IgG2a autoantibodies. After treatment with anti-CD20 or control mAb, anti-mouse and anti-human PG IgG2a were not significantly different (Fig. 6⇓, B and D). In contrast to the IgG2a Ab titers, both anti-mouse and anti-human PG IgG1 titers were significantly reduced in the B cell-depleted mice in comparison to control mAb group (Fig. 6⇓, A and C). Autoantibody titers waned with time and those of B cell-depleted mice reached a lower maximum level than did those of control Ab-treated mice (Fig. 6⇓). Autoantibody titers of PGIA mice depleted of B cells correlate with a reduction in disease. In combining two separate experiments a positive correlation (r = 0.82) (p< = 0.01) was found between weeks 2 and 7 after anti-mCD20 mAb treatment. Suppression of PG-specific Ab titers in anti-mCD20 mAb-treated mice. Serum from PG-DDA-immunized mice treated with anti-mCD20 mAb (n = 5–10) or control mAb (n = 5–10) were collected before mAb injection and then weekly for 7 wk. PG-specific human IgG1 (A) and IgG2a (B) and mouse PG-specific IgG1 (C) and IgG2a (D) Abs were measured by ELISA. Values are means ± SEM and are representative of three independent experiments. ∗, p < 0.05. Ag presentation by B cells is critical for the activation of an autoreactive CD4+ T cell population and the subsequent development of PGIA (19, 22). The need to focus Ag to B cells for presentation to T cells indicates that B cell activation of T cells is critical for the development of disease (19, 22). The loss of B cells in this autoreactive cycle could result in a decrease in autoreactive T cell activation, thereby quelling the inflammatory response. To examine whether there was a reduction in PG-specific T cell activation, B cell depletion therapy was begun 4 days after the second immunization. After 21 days, splenic CD4+ T cells were purified, restimulated with PG in the presence of irradiated naive spleen cells and PG (10 μg/ml), and assessed for PG-specific T cell proliferation. CD4+ T cells from anti-mCD20 mAb-treated mice proliferated less efficiently than did T cells from control mAb-treated mice, indicating that either fewer autoreactive CD4+ T cells were primed or they were less responsive to Ag (Fig. 7⇓A). Reduction in PG-specific T cell autoreactivity in B cell-depleted mice. Splenic CD4+ T cells of either anti-mCD20 mAb- or control mAb-treated mice were purified 21 days after Ab treatment and mixed with naive irradiated APCs with or without PG for 5 days and measured for proliferation (A) by [3H]thymidine incorporation for the final 24 h. Similar cultures were established for the number of cytokine secreting CD4+ T cells, with detection by ELISPOT for IL-17 (B) and IL-4 (C) at 72 h and IFN-γ at 48 h (D). Values indicate the means ± SEM of quadruplicate cultures. ∗, p < 0.05. 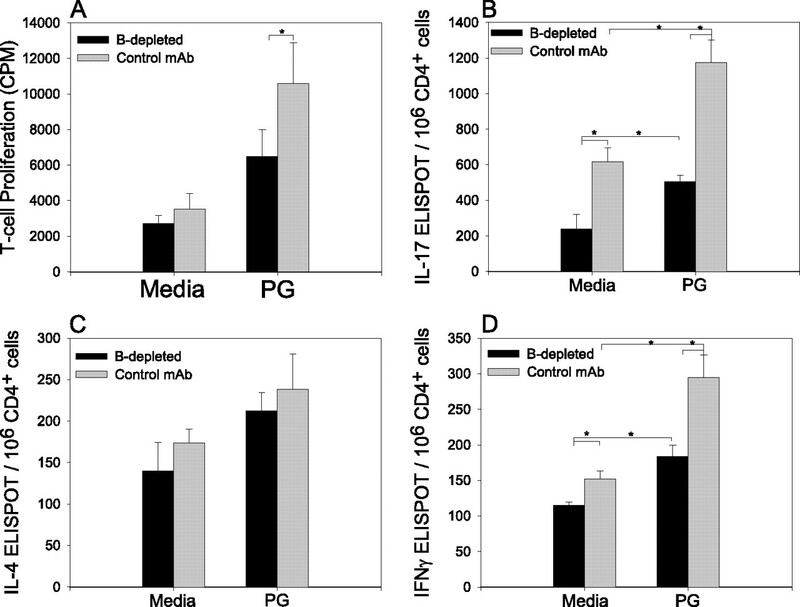 To characterize the effect of B cell depletion on Th cell cytokine profiles, purified CD4+ T cells from mAb-treated mice were assessed for the number of IL-4 (Th2), IFN-γ (Th1), and IL-17 (Th17) by ELISPOT. 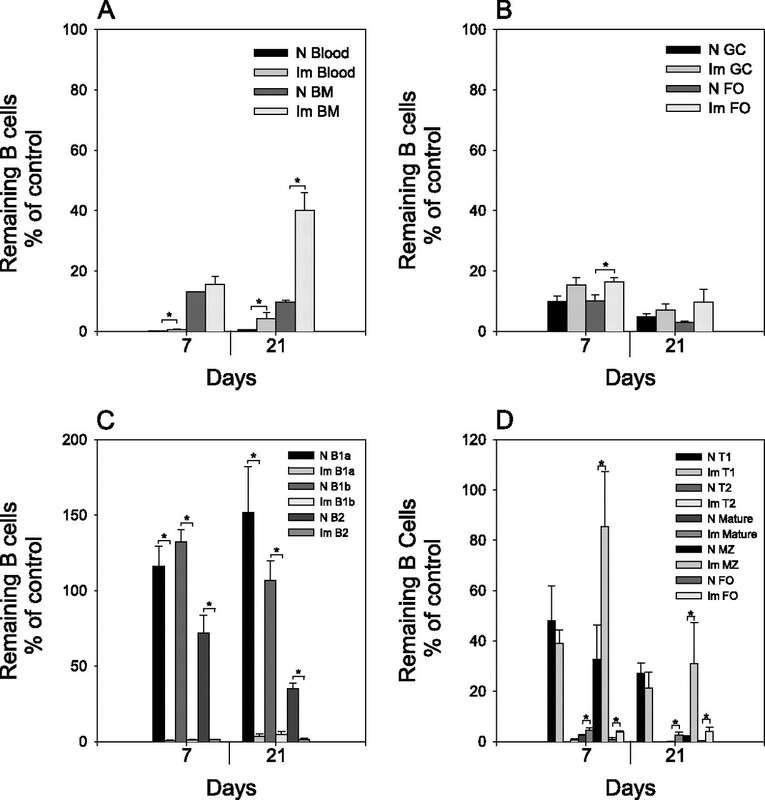 Although all cultures responded to PG restimulation, only IFN-γ- (p = 0.042) and IL-17- (p = 0.05) producing cells were diminished in B cell-depleted mice (Fig. 7⇑, B–D), indicating that the Th1 and Th17, but not the Th2, compartments in arthritic mice were inhibited by B cell depletion. 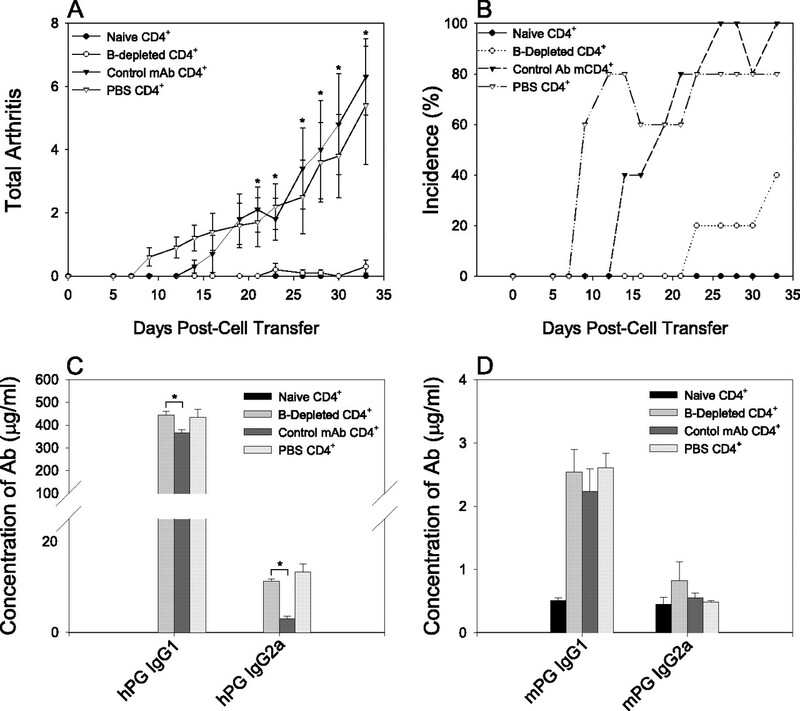 The reduction in PG-specific CD4+ T cell proliferation and cytokine production in vitro suggests that priming of autoreactive helper T cells in B cell-depleted mice was suboptimal. To confirm that the reduction in priming of CD4+ T cells correlates with a reduction in arthritogenic potential, the ability of CD4+ T cells to adoptively transfer disease into SCID mice was assessed. Spleen cells from B cell-depleted or control mAb-treated mice were obtained 20 days after mAb treatment. Purified CD4+ T cells combined with B cells and APCs (T cell-depleted spleen cells) from arthritic mice were transferred into SCID recipients. Development of arthritis was monitored over time. Purified CD4+ splenic T cells from arthritic mice treated with PBS or those from naive nonimmunized mice acted as positive and negative control groups, respectively. CD4+ T cells obtained from PG-immunized PBS-treated mice induced an aggressive inflammation beginning 7 days after transfer, leading to severe inflammation and ankylosis in 80% of recipients, whereas CD4+ T cells from naive mice were unable to transfer arthritis (Fig. 8⇓, A and B). PG-immunized mice treated with control mAb generated CD4+ T cells equivalent to PBS treated mice in their ability to transfer disease with similar severity and incidence. CD4+ T cells originating from B cell-depleted PG-immunized mice were significantly reduced in their ability to transfer PGIA, and those mice that did develop PGIA (40%) experienced a very mild disease in comparison to SCID mice that received CD4+ T cells from control mAb- or PBS-treated mice (Fig. 8⇓, A and B). CD4+ T cells from B cell-depleted mice are unable to transfer arthritis. Naive SCID mice received i.p. a mixture of PG, T cell-depleted spleen cells from arthritic mice and purified splenic CD4+ T cells from either naive (n = 5), anti-mCD20 mAb- (n = 5), control mAb- (n = 5), or PBS- (n = 5) treated mice 20 days after treatment. Following transfer, mice were monitored for PGIA severity of arthritis severity (A) and incidence (B). Serum samples collected from each group (n = 5) were analyzed for reconstituted SCIDs. Sera were analyzed by ELISA for IgG1 and IgG2a Ab-specific human (C) or mouse (D) PG. Values are means ± SEM and are representative of two independent experiments. ∗, p < 0.05. The inability to transfer PGIA with CD4+ T cells from B cell-depleted mice was not due to a defect or a suppression of primed B cell activity, as autoantibody titer levels of SCID recipient mice were comparable between groups (Fig. 8⇑, C and D). Surprisingly, an increase in anti-human PG IgG1 (p = 0.016) and IgG2a (p = 0.032) was observed in SCID recipients of CD4+ T cells transferred from B cell-depleted PGIA mice as compared with anti-PG levels from control mAb-treated PGIA mice (Fig. 8⇑C). These results demonstrate that B cell depletion therapy during development of arthritis suppresses the autoreactive T cell response. Animal models of disease play an important role in understanding mechanisms of disease. In several autoimmune diseases B cell depletion therapy has proven efficacious. The present study was designed to define the role of B cell depletion in a model that is similar to B cell depletion therapy in RA. Our initial studies assessed the ability of an anti-mCD20 mAb of the IgG2a isotype to deplete B cells. As expected from reports by others on anti-mCD20 depletion, by 14 days after treatment peripheral blood, germinal center, follicular, T2, mature, and marginal zone B cells were substantially depleted, whereas in the peritoneal cavity B1a, B1b, and B2 B cells were relatively resistant. However, after immunization with PG, marginal zone and mature bone marrow B cells were more resistant, and peritoneal B1a and B1b B cells were more sensitive to depletion. The sensitivity to depletion of peritoneal B cells is likely a result of activated macrophages in the peritoneal cavity due to the i.p. immunization with PG in adjuvant. The subsequent inflammatory response in the peritoneal cavity exposes the peritoneal B cells to activated macrophages mediating FcγR-dependent B cell depletion (37). The increased resistance of marginal zone B cells may be due to their activation state, physical niche, or an increase in survival factors. Recent data from Gong et al. indicate that B cell activating factor plays an important role in determining the susceptibility of mouse marginal zone B cells to depletion using an anti-hCD20 mAb in human CD20 transgenic mice (29). To determine whether B cells are important to maintain a state of chronic activation in PGIA, B cells were depleted after the initiation of disease at a time point when PG-specific autoantibodies and T cell reactivity were established but inflammation in the joints was not yet apparent. After treatment, arthritis developed in both anti-CD20 mAb- and control mAb-treated mice for ∼19 days in a similar manner. Following day 19, progression of arthritis in the anti-CD20 mAb-treated mice was prevented. Although B cell repopulation occurred over time, arthritis did not relapse in the time interval the mice were monitored. In CIA, B cell depletion before sensitization to collagen resulted in arthritis relapse very late (30). Thus, it is possible that if we had waited longer similar results would have been observed. Similar to B cell depletion in RA, PG-specific Ab levels decreased, and this decrease correlated with a reduction in disease. However, the reduction in Abs may be only one mechanism by which B cell depletion contributes to the reduction in arthritis. Clinical success of CTLA-4Ig, a CD80/86 blocking agent, has highlighted the complicity of costimulation in the perpetuation of autoimmunity (40). We have previously shown that B cells are critical as APCs in the development of PGIA (19). B cells must recognize and present PG to T cells for arthritis to develop. Furthermore, B cell expression of CD80/86 is essential for induction of disease but dispensable for Ab production (27). In these previous experiments, the defects in B cell APC activity preceded sensitization with PG, and therefore we were unable to distinguish between the effects of B cells on T cell priming or on perpetuation of T cell activation. In the present study, PG-specific T cells were present at the time of B cell depletion, as reflected in the secondary recall response of CD4+ T cells to PG (Fig. 3⇑A). The reduction in CD4+ T cell proliferation (Fig. 7⇑A) and the inability of CD4+ T cells from B cell-depleted mice to transfer disease into SCID recipients (Fig. 8⇑) indicate that there was a reduction in the PG-specific effector or memory T cell pools generated in the absence of B cells. This work extends the observations of B cell depletion in a model of SLE (31), and it supports the idea that B cells are involved in chronic T cell activation. B cell Ag presentation, more than other APCs, may be critically important for CD4+ T cell activation in chronic disease. This could be due to a continuous expansion of a high-affinity population of autoantigen-specific B cells in secondary lymphoid tissues. These high-affinity B cells may be important in driving the increased expansion of pathogenic autoreactive T cells. The residual inflammation in B cell-depleted mice (Fig. 4⇑A) indicates that T cell activation by other APCs also occurs but may not be sufficient for severe arthritis. Some RA patients that develop more aggressive symptoms of disease have tertiary lymphoid structures similar to germinal centers within the synovium that are comprised of B cells, T cells, and dendritic cells (41, 42, 43). Depletion of B cells within the synovium could disrupt the formation of these structures and subsequent T and B cell interaction (43). The ability of B cells to dictate an immune response is described by their cytokine profiles. Be1 B cells have been shown to produce IFN-γ and IL-12 under certain circumstances that can orchestrate a Th1 CD4+ T cell response (44). Herein we demonstrate that the depletion of B cells during PGIA results in a reduction in both IFN-γ- and IL-17-producing CD4+ T cells (Fig. 7⇑, B and D). These data suggest that the loss of cytokine production by B cells might be a factor responsible for clinical efficacy. Although the decrease in autoantibody correlates with a reduction in disease in RA and PGIA (Fig. 6⇑), it is yet to be determined whether autoantibody is a crucial component in the perpetuation of RA, or merely a consequence of continuous B and T cell activation. 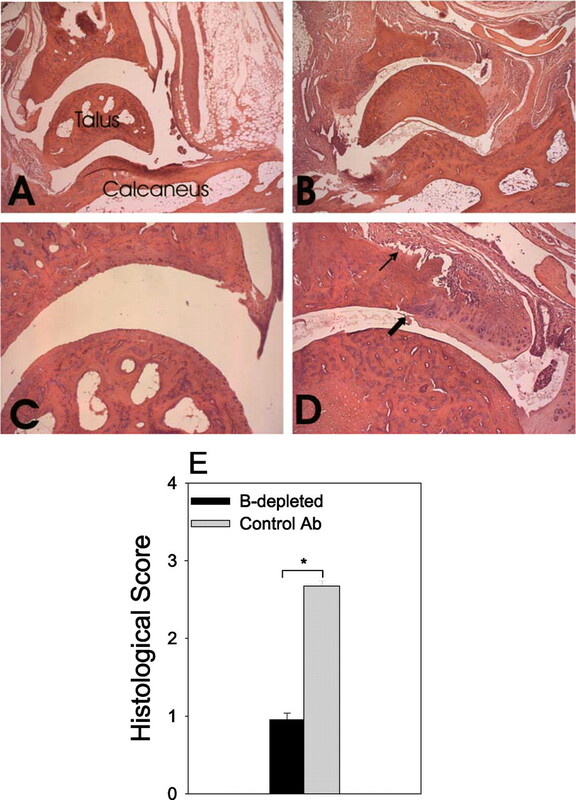 However, in PGIA, PG-specific Abs are essential for development of arthritis, and thus the substantial reduction in Ab titers in B cell-depleted mice likely contributes to the reduction in arthritis. In our adoptive transfer studies, T cells from B cell-depleted mice were unable to transfer disease, but autoantibodies were equivalent to those in control mAb-treated mice (Fig. 8⇑). This prevention of arthritis without a disruption of autoantibody suggests that the reduction of autoantibody during arthritis observed with B cell depletion in RA patients may be secondary to the effect of lowered autoreactive T cell activation. The ability of anti-mCD20 mAb treatment to suppress T cell activation supports a role for B cells in maintaining chronic activation of T cells beyond the point of autoimmune initiation (28). The inability of the autoreactive CD4+ T cell response to optimally develop in B cell-depleted mice may be due to increased regulation. It has been reported that loss of costimulatory signals, which are common to B cells and other APCs, results in the conversion of CD4+ effector T cells toward a more regulatory population due to induction of anergy or up-regulation of FoxP3 (45, 46). Also, B cell expansion blocks T cell regulatory activity, suggesting that depletion of B cells could expand a regulatory T cell population (47). Expansion of regulatory T cells has also recently been observed in lupus nephritis patients treated with rituxmab (48). In summary, our results demonstrate that B cell depletion has a dual effect on the development of arthritis. Depletion of B cells inhibits autoantibody production and prevents chronic activation of autoreactive T cells. We thank Dr. Jeffrey Oswald and all the staff of the Comparative Research Center of Rush University Medical Center for their expert technical assistance. Drs. Dunn and Kehry are employees of Biogen-Idec. ↵1 This research was supported by National Institutes of Health Grant AR47657 (to A.F.). ↵3 Abbreviations used in this paper: RA, rheumatoid arthritis; CIA, collagen-induced arthritis; PG, proteoglycan; PGIA, proteoglycan-induced arthritis; RF, rheumatoid factor; SLE, systemic lupus erythematosus. Goronzy, J. J., C. M. Weyand. 2005. Rheumatoid arthritis. Immunol. Rev. 204: 55-73. Lee, D. M., M. E. Weinblatt. 2001. Rheumatoid arthritis. Lancet 358: 903-911. Dunlop, D. D., L. M. Manheim, E. H. Yelin, J. Song, R. W. Chang. 2003. The costs of arthritis. Arthritis Rheum. 49: 101-113. Firestein, G. S.. 2005. Immunologic mechanisms in the pathogenesis of rheumatoid arthritis. J. Clin. Rheumatol. 11: S39-S44. Franklin, E. C., H. R. Holman, H. J. Muller-Eberhard, H. G. Kunkel. 1957. An unusual protein component of high molecular weight in the serum of certain patients with rheumatoid arthritis. J. Exp. Med. 105: 425-438. Janossy, G., G. Panayi, O. Duke, M. Bofill, L. W. Poulter, G. Goldstein. 1981. Rheumatoid arthritis: a disease of T-lymphocyte/macrophage immunoregulation. Lancet 2: 839-842. Edwards, J. C., L. Szczepanski, J. Szechinski, A. Filipowicz-Sosnowska, P. Emery, D. R. Close, R. M. Stevens, T. Shaw. 2004. Efficacy of B-cell-targeted therapy with rituximab in patients with rheumatoid arthritis. N. Engl. J. Med. 350: 2572-2581. Martin, F., A. C. Chan. 2004. Pathogenic roles of B cells in human autoimmunity: insights from the clinic. Immunity 20: 517-527. Grillo-Lopez, A. J., E. Hedrick, M. Rashford, M. Benyunes. 2002. Rituximab: ongoing and future clinical development. Semin. Oncol. 29: 105-112. Edwards, J. C., G. Cambridge. 2006. B-cell targeting in rheumatoid arthritis and other autoimmune diseases. Nat. Rev. Immunol. 6: 394-403. St. Clair, E. W., T. F. Tedder. 2006. New prospects for autoimmune disease therapy: B cells on deathwatch. Arthritis Rheum. 54: 1-9. Martin, F., A. C. Chan. 2006. B cell immunobiology in disease: evolving concepts from the clinic. Annu. Rev. Immunol. 24: 467-496. Lim, P. L., M. Zouali. 2006. Pathogenic autoantibodies: emerging insights into tissue injury. Immunol. Lett. 103: 17-26. Nielen, M. M., D. van Schaardenburg, H. W. Reesink, R. J. van de Stadt, I. E. van der Horst-Bruinsma, M. H. de Koning, M. R. Habibuw, J. P. Vandenbroucke, B. A. Dijkmans. 2004. Specific autoantibodies precede the symptoms of rheumatoid arthritis: a study of serial measurements in blood donors. Arthritis Rheum. 50: 380-386. Tsokos, G. C., S. D. Fleming. 2004. Autoimmunity, complement activation, tissue injury and reciprocal effects. Curr. Dir. Autoimmun. 7: 149-164. Kaplan, C. D., Y. Cao, J. S. Verbeek, M. Tunyogi-Csapo, A. Finnegan. 2005. Development of proteoglycan-induced arthritis is critically dependent on Fcγ receptor type III expression. Arthritis Rheum. 52: 1612-1619. Stuart, J. M., F. J. Dixon. 1983. Serum transfer of collagen-induced arthritis in mice. J. Exp. Med. 158: 378-392. O’Neill, S. K., M. J. Shlomchik, T. T. Glant, Y. Cao, P. D. Doodes, A. Finnegan. 2005. Antigen-specific B cells are required as APCs and autoantibody-producing cells for induction of severe autoimmune arthritis. J. Immunol. 174: 3781-3788. Petkova, S. B., K. N. Konstantinov, T. J. Sproule, B. L. Lyons, M. A. Awwami, D. C. Roopenian. 2006. Human antibodies induce arthritis in mice deficient in the low-affinity inhibitory IgG receptor FcγRIIB. J. Exp. Med. 203: 275-280. Wooley, P. H., S. W. Siegner, J. D. Whalen, R. L. Karvonen, F. Fernandez-Madrid. 1992. Dependence of proteoglycan induced arthritis in BALB/c mice on the development of autoantibodies to high density proteoglycans. Ann. Rheum. Dis. 51: 983-991. Mikecz, K., T. T. Glant, E. Buzas, A. R. Poole. 1990. Proteoglycan-induced polyarthritis and spondylitis adoptively transferred to naive (nonimmunized) BALB/c mice. Arthritis Rheum. 33: 866-876. Brennan, F. R., G. Negroiu, E. I. Buzas, C. Fulop, K. Hollo, K. Mikecz, T. T. Glant. 1995. Presentation of cartilage proteoglycan to a T cell hybridoma derived from a mouse with proteoglycan-induced arthritis. Clin. Exp. Immunol. 100: 104-110. Roosnek, E., A. Lanzavecchia. 1991. Efficient and selective presentation of antigen-antibody complexes by rheumatoid factor B cells. J. Exp. Med. 173: 487-489. Krzysiek, R., E. A. Lefevre, W. Zou, A. Foussat, J. Bernard, A. Portier, P. Galanaud, Y. Richard. 1999. Antigen receptor engagement selectively induces macrophage inflammatory protein-1α (MIP-1α) and MIP-1β chemokine production in human B cells. J. Immunol. 162: 4455-4463. Yellin, M. J., J. Sinning, L. R. Covey, W. Sherman, J. J. Lee, E. Glickman-Nir, K. C. Sippel, J. Rogers, A. M. Cleary, M. Parker, et al 1994. T lymphocyte T cell-B cell-activating molecule/CD40-L molecules induce normal B cells or chronic lymphocytic leukemia B cells to express CD80 (B7/BB-1) and enhance their costimulatory activity. J. Immunol. 153: 666-674. O’Neill, S. K., Y. Cao, K. M. Hamel, P. D. Doodes, G. Hutas, A. Finnegan. 2007. Expression of CD80/86 on B cells is essential for autoreactive T cell activation and the development of arthritis. J. Immunol. 179: 5109-5116. Gong, Q., Q. Ou, S. Ye, W. P. Lee, J. Cornelius, L. Diehl, W. Y. Lin, Z. Hu, Y. Lu, Y. Chen, et al 2005. Importance of cellular microenvironment and circulatory dynamics in B cell immunotherapy. J. Immunol. 174: 817-826. Yanaba, K., Y. Hamaguchi, G. M. Venturi, D. A. Steeber, E. W. St. Clair, T. F. Tedder. 2007. B cell depletion delays collagen-induced arthritis in mice: arthritis induction requires synergy between humoral and cell-mediated immunity. J. Immunol. 179: 1369-1380. Ahuja, A., J. Shupe, R. Dunn, M. Kashgarian, M. R. Kehry, M. J. Shlomchik. 2007. Depletion of B cells in murine lupus: efficacy and resistance. J. Immunol. 179: 3351-3361. Svensson, L., J. Jirholt, R. Holmdahl, L. Jansson. 1998. B cell-deficient mice do not develop type II collagen-induced arthritis (CIA). Clin. Exp. Immunol. 111: 521-526. Shlomchik, M. J., M. P. Madaio, D. Ni, M. Trounstein, D. Huszar. 1994. The role of B cells in lpr/lpr-induced autoimmunity. J. Exp. Med. 180: 1295-1306. Hanyecz, A., S. E. Berlo, S. Szanto, C. P. Broeren, K. Mikecz, T. T. Glant. 2004. Achievement of a synergistic adjuvant effect on arthritis induction by activation of innate immunity and forcing the immune response toward the Th1 phenotype. Arthritis Rheum. 50: 1665-1676. Glant, T. T., A. Finnegan, K. Mikecz. 2003. Proteoglycan-induced arthritis: immune regulation, cellular mechanisms, and genetics. Crit. Rev. Immunol. 23: 199-250. O’Keefe, T. L., G. T. Williams, S. L. Davies, M. S. Neuberger. 1998. Mice carrying a CD20 gene disruption. Immunogenetics 48: 125-132. Hamaguchi, Y., Y. Xiu, K. Komura, F. Nimmerjahn, T. F. Tedder. 2006. Antibody isotype-specific engagement of Fcγ receptors regulates B lymphocyte depletion during CD20 immunotherapy. J. Exp. Med. 203: 743-753. Hamaguchi, Y., J. Uchida, D. W. Cain, G. M. Venturi, J. C. Poe, K. M. Haas, T. F. Tedder. 2005. The peritoneal cavity provides a protective niche for B1 and conventional B lymphocytes during anti-CD20 immunotherapy in mice. J. Immunol. 174: 4389-4399. Gonggrijp, R., W. J. Mullers, H. F. Dullens, C. P. van Boven. 1985. Antibacterial resistance, macrophage influx, and activation induced by bacterial rRNA with dimethyldioctadecylammonium bromide. Infect. Immun. 50: 728-733. Kremer, J. M., H. K. Genant, L. W. Moreland, A. S. Russell, P. Emery, C. Abud-Mendoza, J. Szechinski, T. Li, Z. Ge, J. C. Becker, R. Westhovens. 2006. Effects of abatacept in patients with methotrexate-resistant active rheumatoid arthritis: a randomized trial. Ann. Intern. Med. 144: 865-876. Weyand, C. M., J. J. Goronzy. 2003. Ectopic germinal center formation in rheumatoid synovitis. Ann. NY Acad. Sci. 987: 140-149. Takemura, S., A. Braun, C. Crowson, P. J. Kurtin, R. H. Cofield, W. M. O’Fallon, J. J. Goronzy, C. M. Weyand. 2001. Lymphoid neogenesis in rheumatoid synovitis. J. Immunol. 167: 1072-1080. Takemura, S., P. A. Klimiuk, A. Braun, J. J. Goronzy, C. M. Weyand. 2001. T cell activation in rheumatoid synovium is B cell dependent. J. Immunol. 167: 4710-4718. Harris, D. P., L. Haynes, P. C. Sayles, D. K. Duso, S. M. Eaton, N. M. Lepak, L. L. Johnson, S. Swain, F. E. Lund. 2000. Reciprocal regulation of polarized cytokine production by effector B and T cells. Nat. Immunol. 1: 475-481. Zhai, Y., L. Meng, F. Gao, Y. Wang, R. W. Busuttil, J. W. Kupiec-Weglinski. 2006. CD4+ T regulatory cell induction and function in transplant recipients after CD154 blockade is TLR4 independent. J. Immunol. 176: 5988-5994. Oderup, C., H. Malm, H. Ekberg, Z. Qi, B. Veress, F. Ivars, M. Corbascio. 2006. Costimulation blockade-induced cardiac allograft tolerance: inhibition of T cell expansion and accumulation of intragraft cD4+Foxp3+ T cells. Transplantation 82: 1493-1500. Olson, T. S., G. Bamias, M. Naganuma, J. Rivera-Nieves, T. L. Burcin, W. Ross, M. A. Morris, T. T. Pizarro, P. B. Ernst, F. Cominelli, K. Ley. 2004. Expanded B cell population blocks regulatory T cells and exacerbates ileitis in a murine model of Crohn disease. J. Clin. Invest. 114: 389-398. Sfikakis, P. P., V. L. Souliotis, K. G. Fragiadaki, H. M. Moutsopoulos, J. N. Boletis, A. N. Theofilopoulos. 2007. Increased expression of the FoxP3 functional marker of regulatory T cells following B cell depletion with rituximab in patients with lupus nephritis. Clin. Immunol. 123: 66-73.